I consider myself a dreamer…not just a dreamer, a big dreamer. But sometimes dreaming big comes with a pretty big dose of reality. Take this weekend for example. I had huge plans to get both our bedroom and bathroom painted. In my head, it would be no big deal. Until I actually thought about what needed to be done just to get the rooms painted. Before we could paint, the cracks in the walls needed to be patched. The cracks weren’t terrible and since I had done this once already in the office, i knew what I was doing. 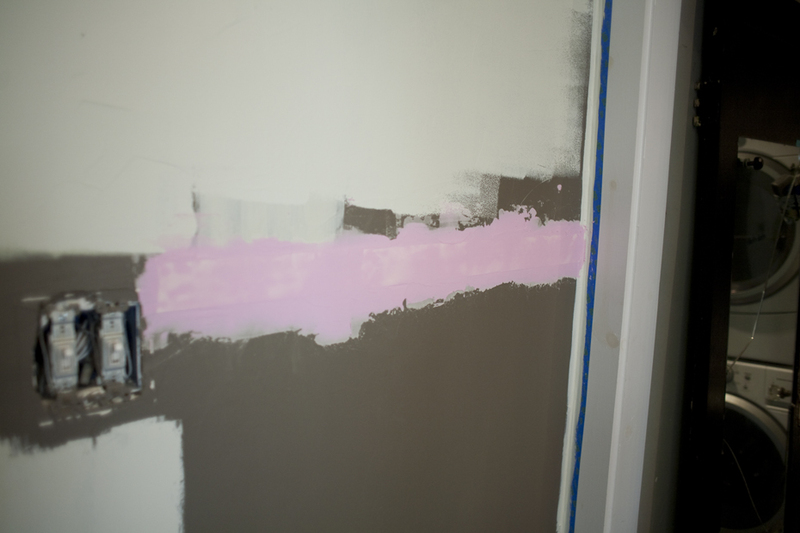 I did not, however, anticipate not having enough spackling when I began the project or the two trips to Home Depot it would take to get the right stuff. 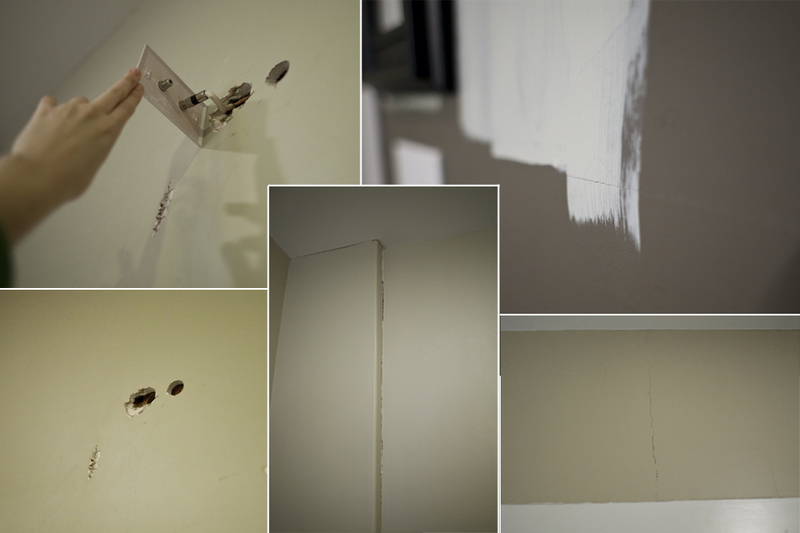 So on Saturday afternoon I finally started fixing the cracks in the walls. What I love about the spackling I used it that it goes on pink and turns white when it is ready to be sanded and applied again or painted. No wondering whether or not it is ready. You’ll probably notice there was already paint on the wall at this point. 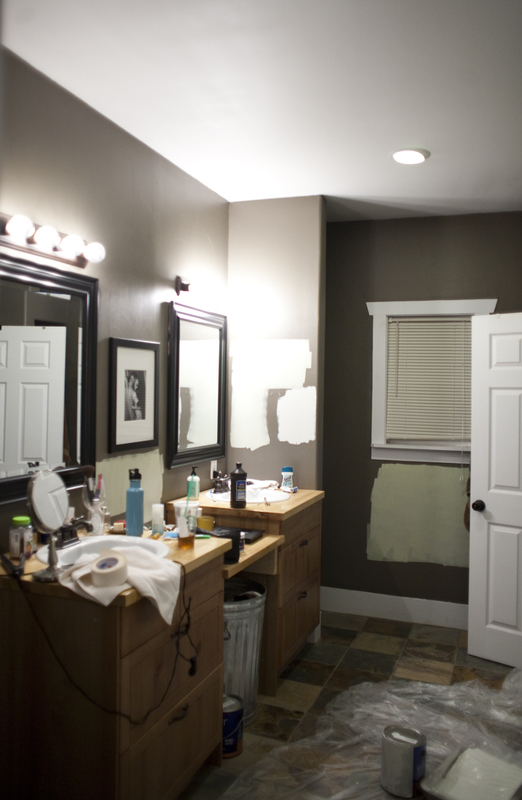 On Friday night when I realized I didn’t have enough spackle, I started painting the other walls. Ignore that for now. 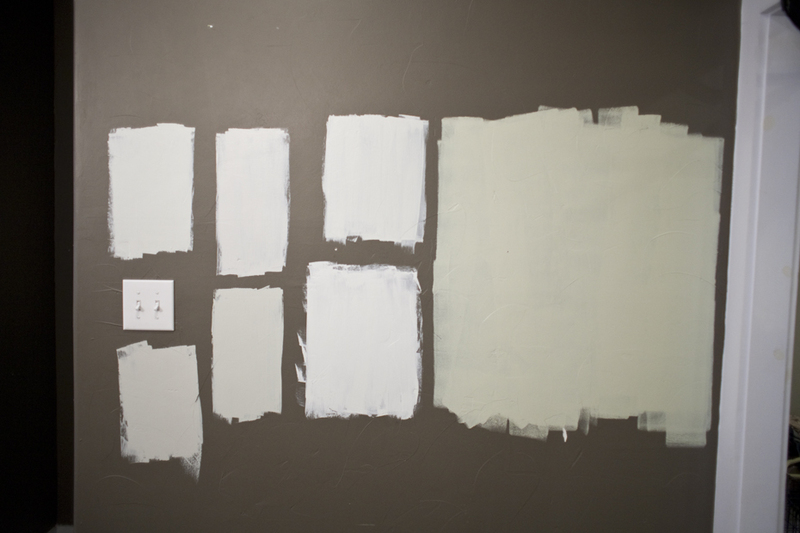 When trying to decided what color to paint the walls , I put up some samples on the wall. When I say “some” I actually mean seven. I put seven different colors on the wall…in November. Two whole months ago. We have been living with this for two months. If you look at this and say, wow…they look almost all the same except for that huge one on the right, you are correct. They do look almost all the same. Almost. There was, however, a definitive winner in this bunch and it is the top left. Does that look white to you? It is close, but has a slight hint of green, which is really hard to see in that photo and not much easier to see in person. But once you get it all over the wall, you can definitely see some green. Ahh, I am feeling calmer already. 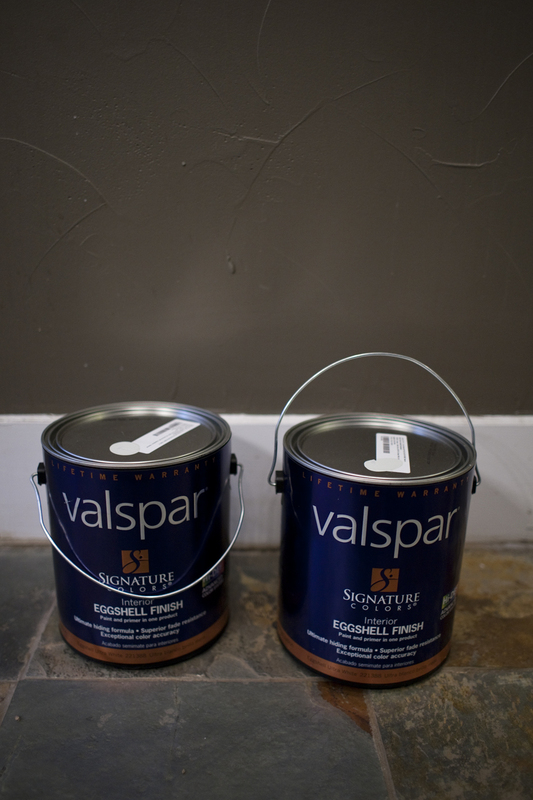 So the actual name of the color that we went with is Stony Path by Valspar. 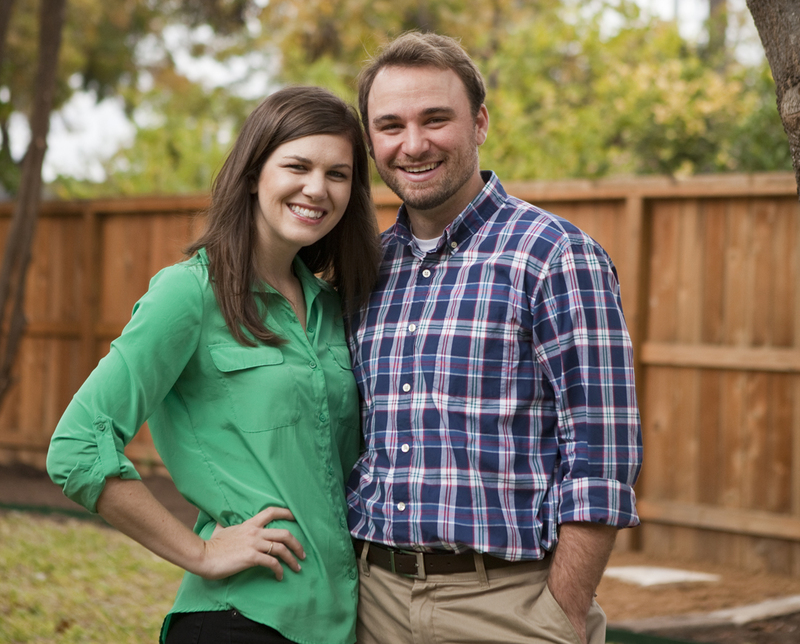 By the way, If you are one of the people that gave us Lowe’s cards for Christmas, this and our bedroom paint is what it went towards. Thanks! And just so we are all all the same page, here is a very, very messy before photo. We don’t normally live like this, I promise. By the time I realized I should take a before photo, I had already started pulling things from the walls and shelves. Now, I am sure some of you are thinking, oh, that color on the wall is lovely though…it is. If you need a dark shade of brown, it really is a lovely color and I’d be more than happy to dig up the paint swatch that the previous homeowners so kindly left for us if you ask for it. However, with the slate in there and the wood vanities, this bathroom felt dark and like a hunter’s lodge, which is not the vibe we are going for…currently. So, I bet you want to see the after photo now, huh? Well, you are going to have to wait a while longer. There are so many nooks and crannies in the bathrooms that it is taking FOREVER to paint. I am not even finished with the first coat. I finished up the first can of paint with just a tiny bit of trim left and wasn’t ready to open the other can of paint. I’m getting to it. Luckily I am picking up friends from the airport at 10:30 this evening so I’ve got lots of time to keep working! But I can show you this photo – I snapped it earlier today. 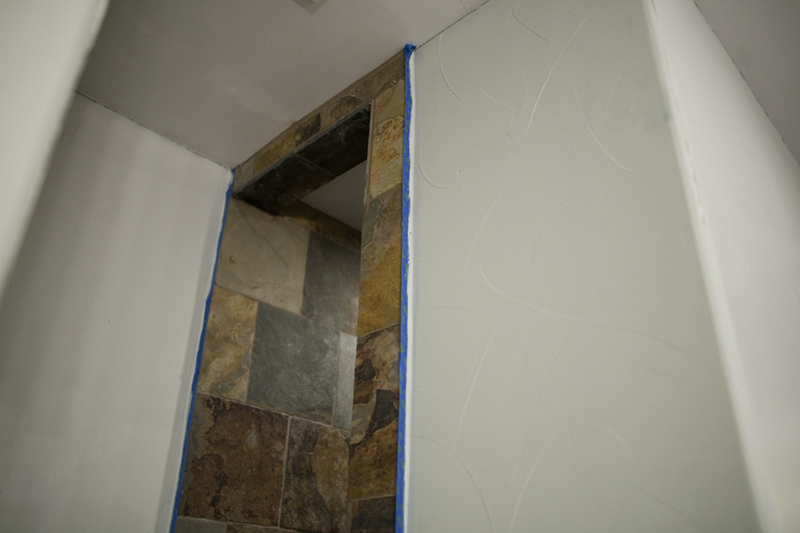 It’s the first coat of paint near our shower. I love how the color plays with the slate that we have ALL OVER our bathroom. Before I get back to work, I do want to share one other project I finished up this weekend. Remember that fabric I showed you in the last post? 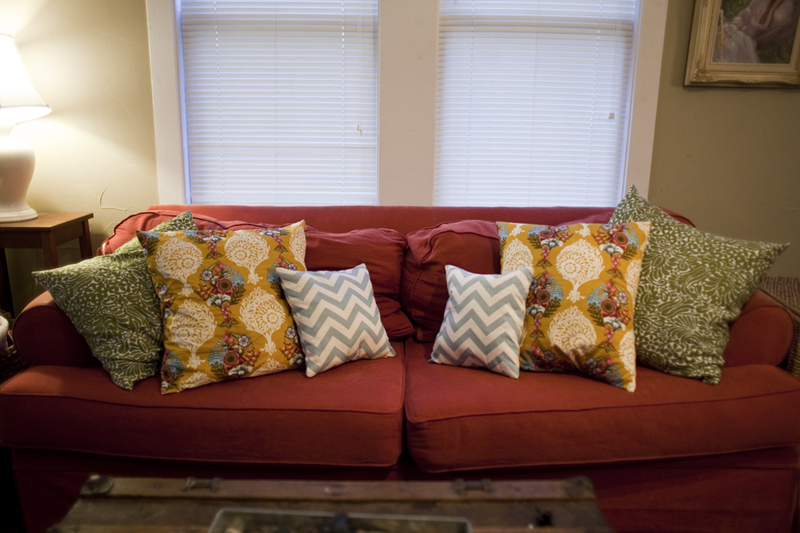 Well, I made my pillows and they now have a new home on our couch. The green and white fabric is actually a shower curtain that I picked up for a photo session two years ago and I hung onto to but never used it again except for a brief time as an actual shower curtain in our old house. I had my grandmother whip those pillowcases out over the Christmas holidays as I was still experimenting with my sewing machine. 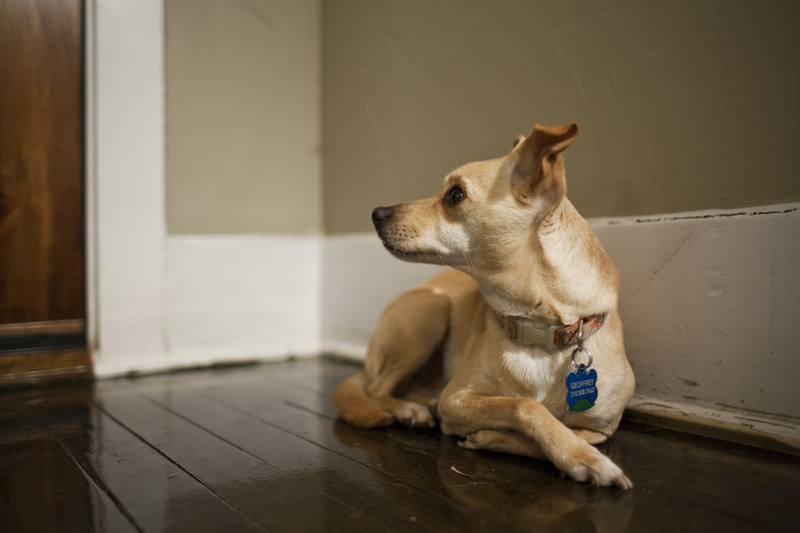 And one final photo of Geoffrey, listening to the train go by. He’s so cute!